I love anything and everything coconut! Thai Coconut Smoothies, Dirty Mountain Dew (Mtn Dew w/ Coconut), Pina Colada anything.. really the list could go on and on. The other day my friend, Jessica, made some No Bake Cookies and was nice enough to share a bag with my family. I ate one and then my family finished them off, before I could go back for a 2nd. I craved them all night and all the next morning. So, I decided to make myself a batch. As I was pulling the ingredients out I glanced up at my North Shore Coconut Peanut Butter and immediatly my mouth watered like it’s never watered before! 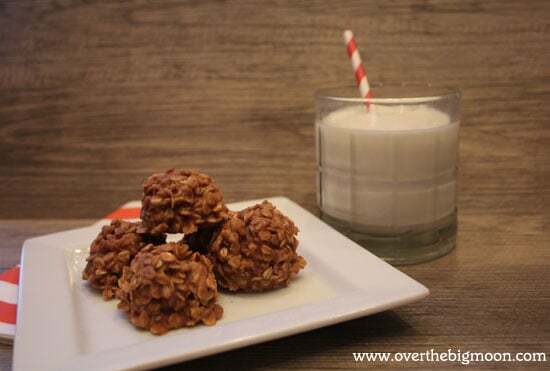 Mmm… Coconut Peanut Butter No Bake Cookies! My next batch of no bakes I make I’m gonna try my friend, Vanessa’s, Biscoff No Bakes! They turned out amazing! I understand that not everyone has Coconut Peanut butter in their pantry, so I did find a recipe using Coconut Flakes that you could try from For the Love of Cooking that looks good! I had to include the above picture – I was taking this picture for my Instagram feed and next thing I know my little Jeffrey’s head was popping up with his tongue out! That little stink! Also, just for a side note, I use my cookie scoop to form the perfect little cookies! It’s hands down one of my favorite kitchen items I have! If you haven’t invested in one – I highly recommend you do! In large saucepan over medium to high heat combine sugar, milk, cocoa, salt, and butter and mix well. Bring to a boil and allow to boil for approx 1 minute to allow the sugar to melt completely. Remove from heat and stir in peanut butter and vanilla until smooth. Add oatmeal and mix well. If needed add another 1/2 cup of oatmeal to soak up any extra liquid. Allow mixture to sit 5-10 mins with an occasional stir to finish thickening up! Lay out a few sheets of parchment or wax paper. Scoop cookie balls onto paper and allow to sit for 1/2+ to harden and allow the cookies time to completly form. Store in an air tight container in room temperature or the fridge. I go on no bake kicks every once in awhile and posted a recipe last year. 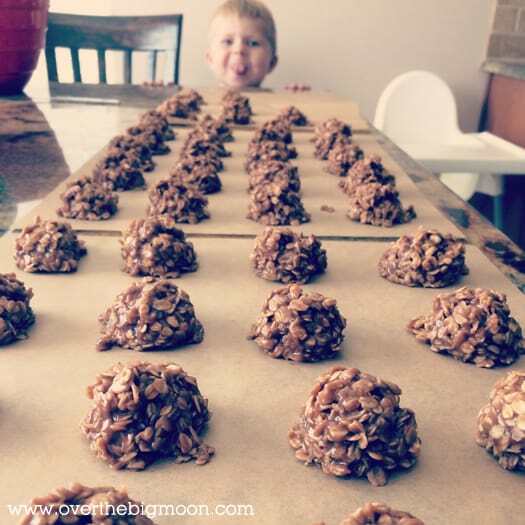 The other day i was thinking Mmmm coconut would be good in no bakes and then saw this post! i must try now! 🙂 You are so cute. So do all bloggers catch up on their TV shows with a computer in front of them or is it just you & I? I can’t watch TV w/o my computer! My mom used to make something like this… and I’d eat like 5 at a time! Mmm we love no bake cookies, but I have never tried coconut peanut butter, but as big coconut fans I’m sure we would love these! Can’t wait to try! I have got to try and make these because my husband has been asking for some no bake cookies forever!! I love anything coconut! I’ve never heard of coconut peanut butter, but it sounds like something I would LOVE! These sound delicious, thanks for sharing!